Keith Kyle grew up in the DC suburbs as the DC Metro system was built and it clearly had a big impact on him. Ever since he moved here in 1994, he has been dreaming of a Seattle connected by high quality transit. 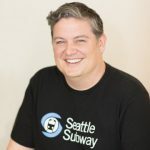 He is a founding member and Executive Director of Seattle Subway. He currently works in IT at Sound Transit. All opinions expressed by Keith are his own and are representative of Seattle Subway and in no way represent Sound Transit.